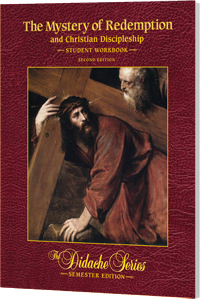 This Student Workbook is an accompaniment to The Mystery of Redemption and Christian Discipleship, 2nd Edition; it allows the student to understand God’s plan of redemption and the redeeming act of Christ’s Passion, Death, and Resurrection through compelling and meaningful exercises. Using combinations of multiple choice, fill in the blank, and short answer questions, the students recall and apply concepts from the textbook to their own lives. The textbook, The Mystery of Redemption and Christian Discipleship, 2nd Edition, corresponds to Book III: The Mission of Jesus Christ (The Paschal Mystery) in the curriculum framework.